The MSF mobile clinic in the village of Stepanivka. In the waiting area, patients attend a mental health awareness presentation from Galina Mizina, MSF psychologist. Despite the “back-to-school ceasefire”—an agreement signed in September to guarantee a safe environment for children to attend school after the summer—shelling continues in many villages located near the front line areas in eastern Ukraine. After nearly three years of conflict, civilians still bear the brunt of the ongoing violence, with more than 1.7 million forced from their homes, according to the Ministry of Social Policy of Ukraine and the International Organization for Migration. Around Mariupol and Kurakhove, MSF is running mobile clinics in 25 different locations to support residents and displaced people. A mobile clinic team usually consists of a doctor, nurse and psychologist, who provide medical and mental health care as well as ensure the donation of medications. Mobile clinics are operated in health facilities, community buildings or even empty schools or kindergartens. Due to the unstable and insecure environment, anxiety-related disorders continue to be the main issue among mental health patients, followed by depression. Here, Elena Pylaeva, an MSF psychologist, explains the effects of this protracted conflict on the mental health of the population. The conflict is breaking communities and families apart. This is very visible in the locations we go to every day: the majority of our patients are elderly women, often widows whose children and grandchildren have fled to find a job or a safer place to live. There are people who have been left behind in their villages near the contact line, living with the fear of shelling and being cut off from basic services, including health care. Then there are people who have fled to these places, who have to come to terms with a new environment and start from zero. In many cases, people who decided to stay lost their jobs. They were working in places such as schools, supermarkets, or kindergartens that had to close because of the conflict. How can a school operate with shells falling nearby? So there are people in their 40s or 50s who have been forced to retire. There is a strong work ethic in eastern Ukraine, so this sudden inactivity is difficult for many people. Women in Ukrainian society work hard, and at the same time have a central role in the family caring for the children, taking care of the house, and bonding family members together. This leaves little to no time to look after oneself. Family plays an essential role in being one of the first places where one can find support. However, when your children have fled and you suddenly become unemployed, your entire universe falls apart. In addition, in some cases the conflict has generated an increase in alcohol consumption, particularly in men. Pressure on women thus becomes higher and often they’ve had to take over their husband’s role providing for the family. An important part of our mental health support is to share ways for people to start addressing their own needs. This is particularly important in such an unstable and insecure situation: while it’s not possible to change the daily reality of the conflict, there are changes that women can make for both their physical and mental health. The main issue we keep seeing is related to stress, either acute or chronic. Around half of patients suffer from anxiety symptoms. This is of course directly related to the conflict: people have lost relatives or friends because of the conflict, and many had to flee because their homes were damaged. People live with the daily fear of shelling, affecting both their mental and physical health. Through our mobile clinics, we offer individual mental health consultations. We also carry out mental health awareness presentations that help inform people about stress and anxiety symptoms and how to cope with them in daily life. In addition, we started group support sessions for the elderly population in Mariupol. These groups include people who fled to Mariupol, as well as people originating in the city. Including both groups—displaced and host communities—facilitates integration into a new environment and creates a space to share feelings linked to the conflict. Our goal is to provide the participants with emotional coping mechanisms that will have a positive effect on their physical health and psychological well-being. For many patients, coming to the mobile clinic is a first step toward breaking isolation. Many elderly people suffering from chronic diseases come to see our nurses and doctors to check their physical condition and receive their treatment. While waiting for their medical consultation they chat with each other. What seems to be just an everyday moment is, on the contrary, a real opportunity to support and listen to each other, and to share feelings on similar experiences. This is a way for people to understand that they are not alone and not the only ones experiencing distressing feelings linked to the conflict. The priority is to take time to look after their health and well-being, and ensure as much as possible that they maintain a healthy lifestyle. It is also good to perform “normal” activities—for some this is cooking, for others it might be gardening. In places that have seen an increase in shelling over the past weeks, we are seeing more people coming for support. Houses continue to be damaged, people still have to hide in their basements, and families keep leaving everything behind them to move to safer places. People are scared and tired. Life in remote villages is tough. So when the conflict started, many people were already living challenging lives and knew how to deal with stress. However, coping in such a volatile environment for so long isn’t the same. In the past weeks, I have seen families who can’t cope with the situation anymore. There are people who have slept in their basement for more than two years and, with the shelling continuing, they now need support to get through what has become a new reality. People are tired of the conflict. They often ask me: when is this going to end? Their energy to be able to face this situation comes from their hope. Hope for the return of a peaceful life. But after so long coping with that much uncertainty and insecurity, it seems that many are running out of energy to cope. 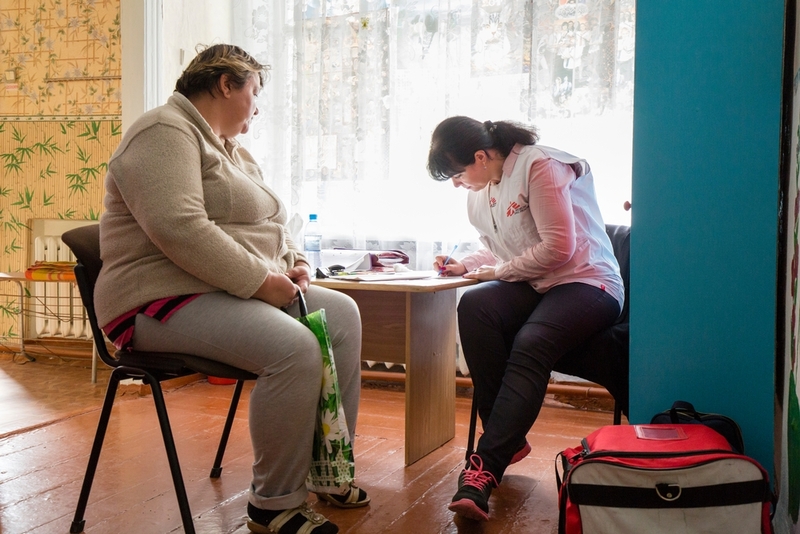 Since the conflict began in eastern Ukraine in April 2014, MSF has supported more than 350 health facilities on the both sides of the contact line with donations of medical equipment and medicines to treat war-wounded, people with chronic diseases, provided primary health care and assisted safe deliveries for pregnant women. Among patients MSF sees for general medical consultations, cardiovascular diseases and diabetes are the two main conditions being reported. The majority of patients are elderly people suffering from chronic diseases.